The worst part about air travel isn’t the cramped airplane cabins, the terrible food, or the awkward security pat-downs–it’s all the waiting and lining up you have to do at the airport. So New York’s JFK is now using a new cellphone tracking system to predict just how long you’ll be standing around. 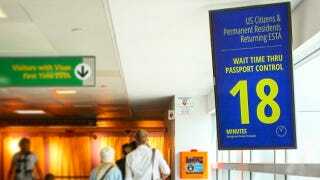 At JFK’s Terminal 4, passengers will now find 13 new information screens that provide surprisingly accurate wait time predictions for the lines at security, customs and border protection, and even the taxi pickup. And it’s all thanks to passengers with smartphones and tablets who’ve left wifi and Bluetooth on. In the past (and still in use at most other airports) stopwatches and surveillance cameras were used to help predict wait times. But JFK’s Terminal 4 recently installed Blip Systems’ wireless beacons that record, encrypt, and timestamp a device’s MAC address. By keeping track of the movement of multiple MAC addresses as they pass through lines, and the entire terminal, the system can calculate wait times down to the minute, with impressive accuracy.